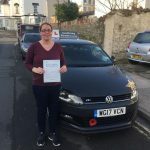 Well done to Claire on smashing her Driving Test and keeping her nerves in check after having Driving Lessons in Torquay with The Driving School sw. This was a big achievement for you and I’m so proud of you. Well done again.